The ovary module of this system consists of either a mouse ovary or mouse follicles encapsulated in an alginate bead. Both of these culture methods allow the maintenance of the 3D structure of ovarian follicles, and the cell-cell interactions that occur between germ cells and somatic cells. In this system, we can mimic the human menstrual cycle by adding FSH and LH at the same times in which these hormones would surge in women (see hormone concentrations below). In response to FSH, which is supplied in the media, ovarian follicles grow and mature. The somatic cells, known as granulosa cells, secrete rising levels of estrogen until ovulation. Ovulation (shown at left) is triggered by a surge of hCG in the culture media. What's left of the follicle after ovulation, known as the corpus luteum, then secretes high levels of progesterone. In the body, if the ovulated egg becomes fertilized, the corpus luteum will continue secreting high levels of progesterone to support implantation and pregnancy. In our system, we can mimic both the normal 28-day cycle, and pregnancy-like conditions. (Ovulation image and hormone concentrations provided by Shuo Xiao and Team Ovary). For the fallopain tube module of this system, we used human explant tissue that contained both stroma and epithelial cells. The fallopian tubes play an important role in reproduction. The beating cilia of the epithelial cells guide the ovulated egg down the tubes to meet with sperm, resulting in fertilization. Ovarian hormones support the health and longevity of this tissue in culture, allowing the cilia to continue beating all 28 days of the cycle. For the uterus module in this system, decellularized endometrial tissue is used as a scaffold (see images at left). To decellularize human tissue, a strong detergent is used to wash away all of the cells, leaving behind the skeleton of the organ. This organ skeleton, known as the extracellular matrix, is made up of tough fibers that provide structural support for each organ and the cells that populate it. Much like how spiders secrete the fibers that make up their webs, and then adhere to them, the cells secrete and adhere to the fibers that make up the organ-specific extracellular matrix. As cells begin to die and new cells are generated, the structure of the extracellular matrix gives the cells clues on their function and location within the organ. Once the tissue has been completely decellularized, the extracellular matrix can then be recellularized with fresh cells. By culturing both epithelial and stromal endometrial cells on the native extracellular matrix, the cultures maintained their native characteristics. Additionally, the cells continued to respond to hormones, and continued proliferating well past the 28-day culture period. 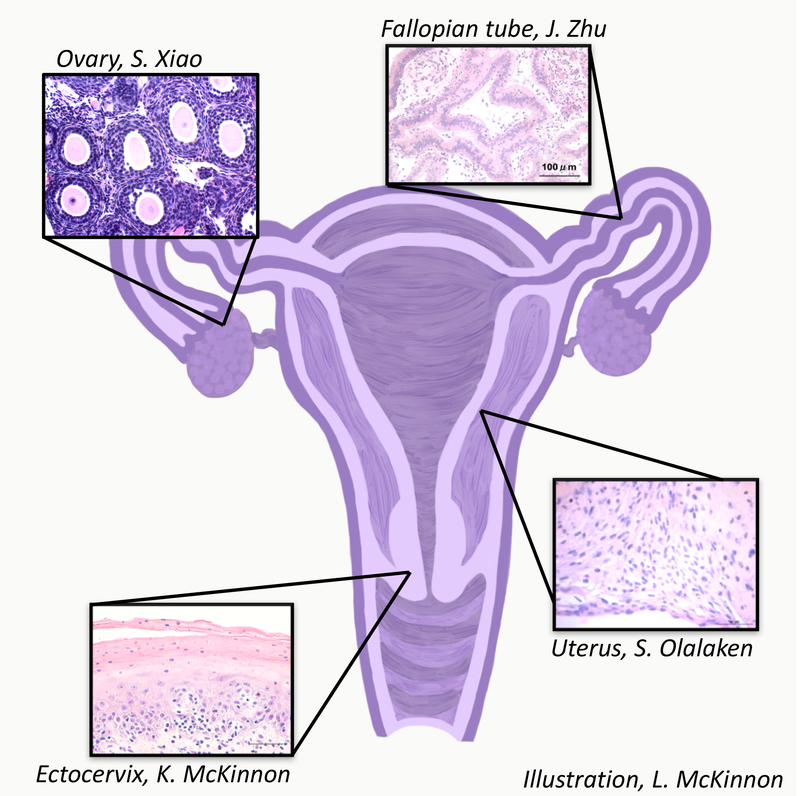 (Decellularized endometrial tissue images provided by Susan Olalekan and Team Uterus). The cervix has two seemingly opposing roles: protecting against potential pathogens, while allowing sperm to survive and pass through to the upper female reproductive tract for fertilization. To balance both of these properties, the cervix is tightly regulated by hormones secreted by the ovary. At the time when fertilization is most likely, immediately following ovulation, the cervical and vaginal environment is much more hospitable to the incoming sperm. However, to maintain protection from potential pathogens, a number of other barrier properties are also regulated by ovarian hormones, such as glycogenation (see image at left showing glycogen staining of human cervix tissue), and the continual regeneration of the many layers of cells that make of this stratified squamous tissue. In our cervical module, we used explants of human cervical tissue that contained both epithelial and stromal cells. The hormones secreted by the ovaries supported the growth and differentiation of the squamous epithelial cells. The cervical explants responded to hormones and the cells continued to proliferate for the 28-day culture period. (Cervical tissue image provided by Kelly McKinnon and Team Cervix). The liver plays an important role not only in the metabolism of drugs, but also in the metabolism of many endogenous factors, such as the steroid hormones produced by the ovary. By including liver spheroids in our culture system, we are able to more accurately mimic the hormonal regulation that occurs within the body. Additionally, it allows us to investigate the stability of non-reproductive tissues in this system, and will be an important tissue to include for toxicology studies. Learn more about the EVATAR research team.